If this does not include some kind of ‘first contact’ I shall be bitterly disappointed with our Endemol overlords. Is there much of a market for snarky comic pastiches of turn of the century adventure fiction? You’d think perhaps not, but then there shouldn’t be a market for dried up old harridans writing a book about grammar, but there was. 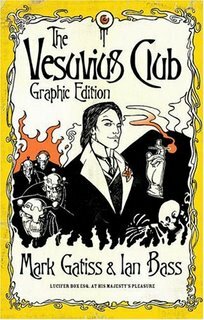 Of course The Vesuvius Club is mainly going to attract readers due to being written by Mark Gatiss of the League Of Gentlemen, not its subject matter. And the self styled “bit of fluff” is entertaining, even if it would be next to impossible to judge it as a pastiche (as I have not read as much Fu Manchu etc as I should). I suspect though that it is shy of much of the casual racism which filled many such books, and am certain that the much more sexually liberated side of the book is very modern. What it did remind me of, despite being a completely different form, was Alan Moore’s League Of Extraordinary Gentlemen. Whilst not having the near obsessive level of (fictional) detail that Moore created in trying to find a thread of continuity between all Victorian fiction, Gatiss clearly finds the era an exciting one to play with. In using the kind of nonsense science that could be justified before real science kicked in, Gatiss can threaten the world with contemporaneous volcanic eruptions, just as Moore could happily fit layers of Victorian Martian dreams into his comic. As such it is fitting that a graphic novel edition has just been released. If it accurately renders the action of the novel in pictures this should be an exceptionally graphic edition. I’ll nip off and give it a look-see for later review, but it should be just as much fun as the original. And with more Lucifer Box to come in 2006 it looks like going beyond just a bit of fluff. 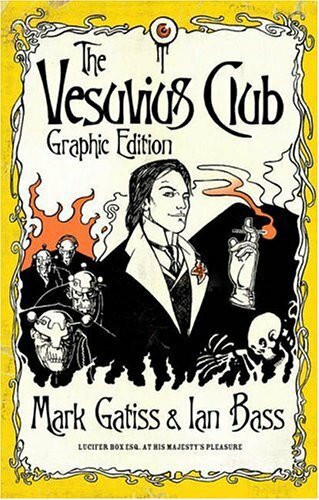 Hopefully, in picking Edwardian and later literature to plunder in Moore’s later editions of the League OF Extraordinary Gentlemen, a nod to Lucifer Box could be made. iv. cold cashews tastin of garlic!! Alan’s post a few below about the shenanigans on ILx just go to show that use of computers can wind you up. Now in a clever reversal of this trend for the purposes of a PBS piece, the UN have unveiled a computer you can wind up back. 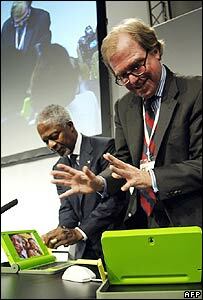 Here Nicky Negroponte and Kofi Annan are seen marveling at the bright green machines with gigantic cranks straight out of Mouse Trap. The story itself is very interesting, and whilst the machines may well be massively underpowered (physically and in processing capacities) they still are a massive step in a computer literate world. Wind-up power would have really helped the cast of Lost after all. Scroll down the article and there are nice things about open source software and so on being mentioned. And indeed the suggestion of cheapness and ubiquity being the key to making them theft-proof has been demonstrated out in the hooky mobile phone market. But could any developing nation really commit to buying every child one of these machines? And content control follows, there are also worrying ideas about disabling machines which do not connect to the official network: this looks like spyware to me. But what worries me the most is that the machines don’t really work: as it is clear that the one in front of Kofi Annan has just got a picture of happy, smiley African kids (you know the one) stuck where its screen should be. There is more than a degree of hubris with the title of Murderball. Even its proper name, Wheelchair Rugby, is a bit misleading, as the rules are more akin to full contact basketball. No-one is murdered, forwarded passes are allowed and whilst the clash of chairs looks impressive, they probably aren’t going all that fast when it happens. How much speed can you get up on a basketball court? The worst that seems to happen is a few wheelchairs get upended. Fallingoverball rather than murderball. Murderball the documentary suffers slightly from fitting far too closely to the formula for fictional sports films. Perhaps the US team, having won every championship up until the opening of the film, do not fit easily into the role of underdogs: though their disability can make it easy to consider them in that way. The film does a nice job in balancing the compelling sports story (US vs Canada) with its dissection of quadriplegic life. The fine and firm message from the later, spills over nicely to the former so the aggression and questionable attitude portrayed on the court seem justified. What the film cannot do though, being a documentary, is control the actual story. So when we see the climactic US vs Canada game at the paralymipics it is presented as the final. Only later do we realise that sport is much more capricious than even nature. And never underestimate a Kiwi team in a game that purports to be related to Rugby. But in a film which is about with dealing with the vicissitudes of life, Murderball’s lack of control over its subject matter seems thematically correct: and it makes for a great movie.